If you want surprises when it comes to medicine cabinets, wait until you remove one from an old home and see all of the discarded double-edged razor blades that are waiting for you behind the plaster. 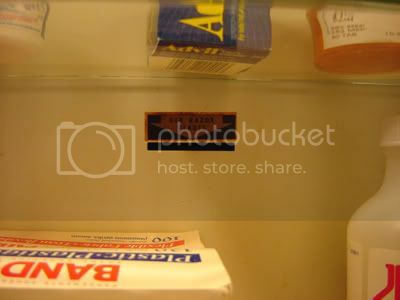 Those of us who grew up in older homes can still remember the tiny slit in the back of medicine cabinets where razor blades were placed instead of garbage cans. Razor blades in garbage cans can be very dangerous, so medicine cabinet manufacturers of old thought it was a great idea to place the dull blades in a wall cavity where no hands could get cut. The odd thing about that was that the razor blade was coming from inside the wall! I pulled the blade out, which ripped a small hole in the wall, and I noticed there were more razor blades inside the wall, many of them actually stuck into the wall. My first thought was that maybe at some point in the past there may have been some remodeling done and for whatever reason they may have used the double-edged blades to cut, and had placed them in the wall and forgot about them and walled up over them. Coins that have been sorted so far date from 1826 through 1964 and include large cents and seated Liberty dimes. The coins have been removed from the old house and placed in secure locations.So far, Bidelman has sorted and cataloged coins with a face value of about $8,500. Value to collectors will be much more, Bidelman said, adding he is already putting some items on the popular Internet auction site eBay. A Caller-Times alum, Ed Rehfeld, faxed me a meditation - including illustrations, no less - in which he calculated that the space in the bin for discarded blades works out to 2,520 cubic inches. That works out to room for 168,000 blades if they fall and lie flat. "Divide the blades you use in a year (remember . . . double- edged) and divide into 168,000 = a bunch of years." The photo atop this article was taken from a blog posting ... you can visit it, but be aware -- it's one of those annoying web sites that forces music upon you. When my dad took out the one in his house in 84, there was a biz card from 1927 for a realtor, no razor blades but he remembers coins. Now we know.